Stunning and very spacious villas (220 m2!) 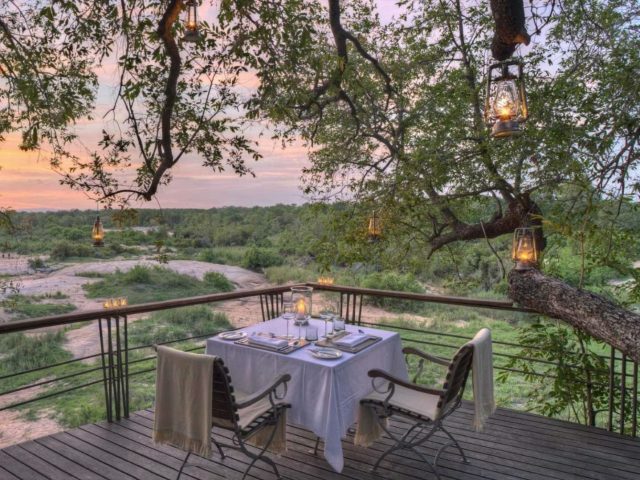 are wonderfully private and romantic spaces – you may find it difficult to prise yourself away from your villa to go up to the main lodge for meals or game drives! The highlight for us has to be the gorgeous outside deck area at your villa – chill with a book or have a snooze on the huge circular day-bed in your sala or perhaps take a dip in your private plunge pool! 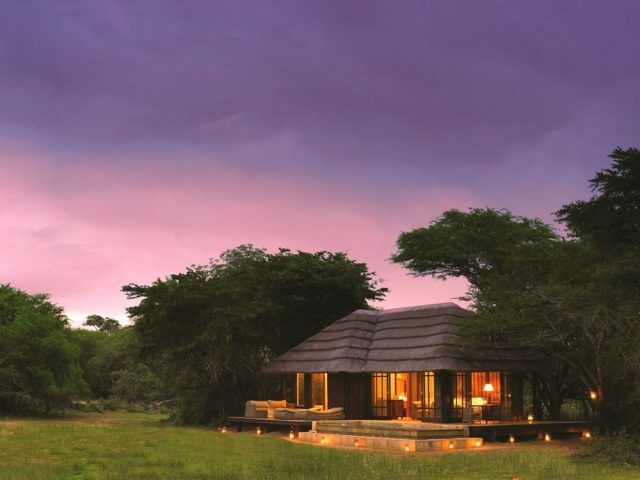 There’s an excellent Africology Spa at Thanda, perfect for a relaxing massage or three between game drives! If you’re coming down from Gauteng, why not do a bush ‘n’ beach trip combining Thanda with some of the nearby beaches of KZN? your deck is a great place to spend holed up for the afternoon, either relaxing on the huge circular day-bed in the sala with a book and pair of binoculars to keep an eye out for game, or taking a refreshing dip in your plunge pool! Thanda Private Game Reserve is situated north of Hluhluwe in northern Zululand - this 14 000 hectare reserve was previously farmland and with the help of wildlife management and extensive game relocations, Thanda (meaning “love” in Zulu) has succeeded in restoring the natural balance and bringing back species which were once endemic to the area, including reintroducing the Big Five! The main lodge at Thanda is quite frankly one of the top luxury lodges in KZN – in fact it’s a frequent award winner in the annual World Travel Awards as one of Africa’s and the world’s leading luxury lodges! 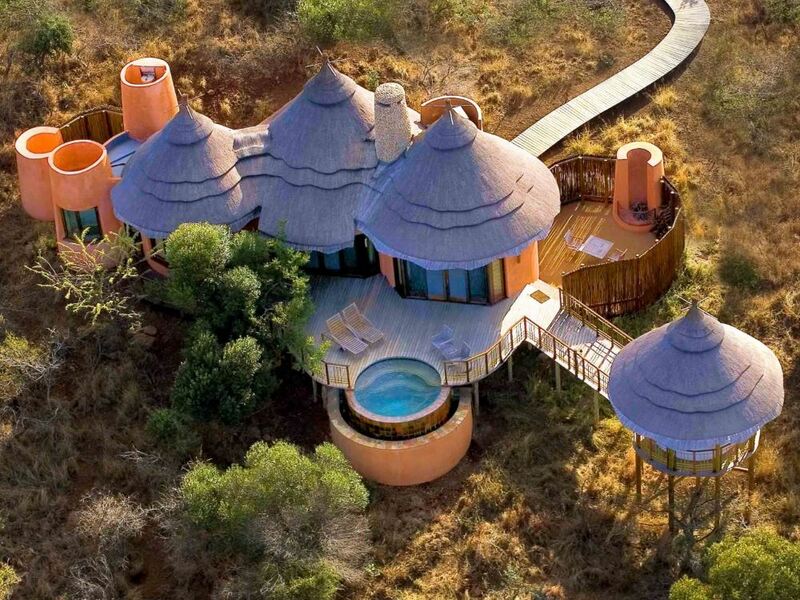 The lodge consists of 9 luxury bush villas which offer a mind-boggling amount of space (220 m2!) as well as the privacy and luxury demanded by the most discerning and demanding travellers. The lodge has been built on a treed hillside and boast great views over the valley. With generous spacing between the 9 villas, you’re guaranteed a sense of privacy and tranquillity so vital to a memorable stay in the bush. The interior of the villas is both attractive and exceptionally spacious with the villas all boasting their own roomy lounge area and master bedroom – they’re separated by a huge inter-leading fireplace which keeps you feeling toasty during the chillier winter months whilst adding a wonderfully romantic ambiance! (the villa also has air-con to keep things comfortable during the heat of summer) Then there’s your en-suite bathroom, complete with an enormous oval shaped standalone bath as well as indoor and outdoor showers! Another noticeable design element to the villas is the circular design theme with scarcely a straight line in sight – again this adds to the natural, almost organic feel of the villas. But it’s perhaps the outside area that’s the real stand-out feature of these villas for us. The interior of the villas open out through large sliding doors onto a gorgeous wooden viewing deck complete with an infinity plunge pool and just alongside this lies a lovely thatched outdoor game-viewing deck or sala – it’s a great place to spend holed up for the afternoon, either relaxing on the massive circular day-bed in the sala with a book and pair of binoculars to keep an eye out for game in the valley below, or taking a refreshing dip in the plunge pool. Just keep an eye out for the ellies who love to come and drink from the pools! Another unusual feature is that each villa also boasts its own private mini-boma perfect for an intimate and romantic dining experience! It would be very easy to just spend the whole of your stay relaxing in and around your villa, but should the urge arise to venture beyond your private retreat then you’ll find the lodge’s public areas to be similarly attractive and luxurious spaces to spend time in. Relax in a comfy sofa in the gorgeous lounge area or enjoy a quiet read in the library. There are viewing decks that overlook tranquil water features where dinner is often set up at night under the stars – there’s also well-stocked wine cellar and cigar bar for those relaxed evenings. 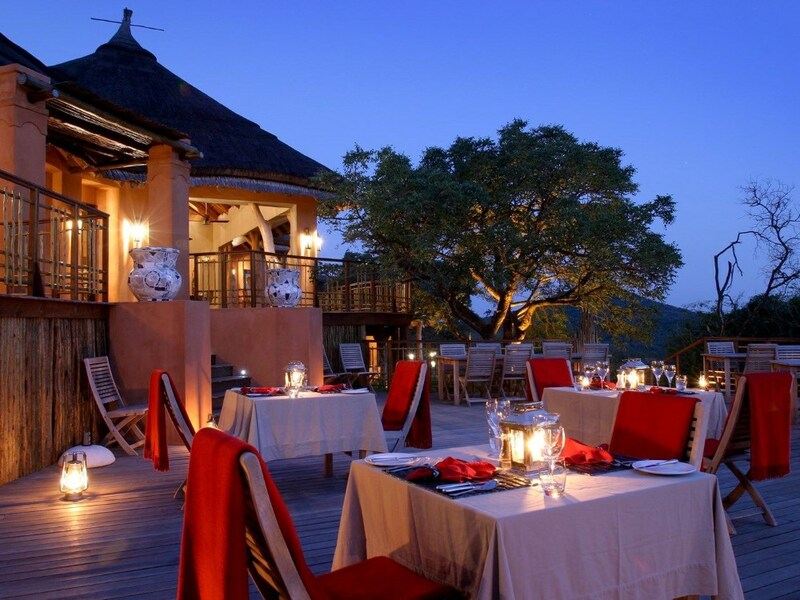 Thanda make sure that they mix up the dining experience so you’ll end up experiencing a variety of venues – if the weather’s dodgy you may be in the formal dining room with its spectacular chandeliers; how about in front of the flames of a roaring fire in the boma or how about a bush dinner lit by paraffin lanterns with Zulu dancers providing a fantastic ambiance! 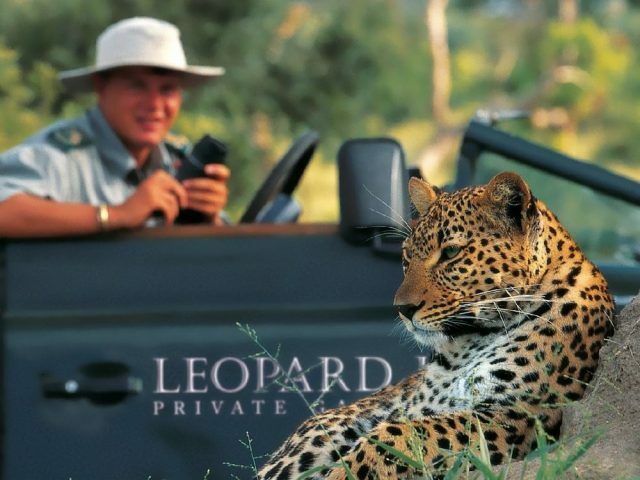 But for most people the highlight of their trip will be enjoying the two game drives a day or guided bush walks in search of these elusive Big Five – both are conducted by knowledgeable and experienced rangers and trackers. You’re likely to find yourself just a few feet away from a pride of lions on a fresh kill or cheetahs that literally rub up against the vehicle, or perhaps in the midst of a breeding herd of ellies! Other wildlife you may spot include the endangered black rhino, hyaena, warthog and loads of plains game – not to mention an abundance of bird life. Between drives you can relax in Thanda fully-fledged Africology Spa having a pampering massage. Whilst the huge and private villas are perfect for couples looking for a romantic break, the good news is that kids are really welcome at Thanda’s main lodge and it’s a superb choice for families. They’ll become members of the Thanda Bucks and Bugs Club which includes activities like a junior rangers course - during game drives with their ranger and tracker, kids will be taught about different mammals, birds, trees, spoor and even the stars, and at the end of the their stay, they will be asked questions by their ranger. If they pass, they will be given a special certificate identifying them as a junior ranger, as well as a small graduation present! At mealtimes they’ll enjoy real children’s favourites like hamburgers, spaghetti Bolognese or toasted sandwiches – even at bedtime they’ll find goodnight stories waiting on their pillows as well as milk and cookies!